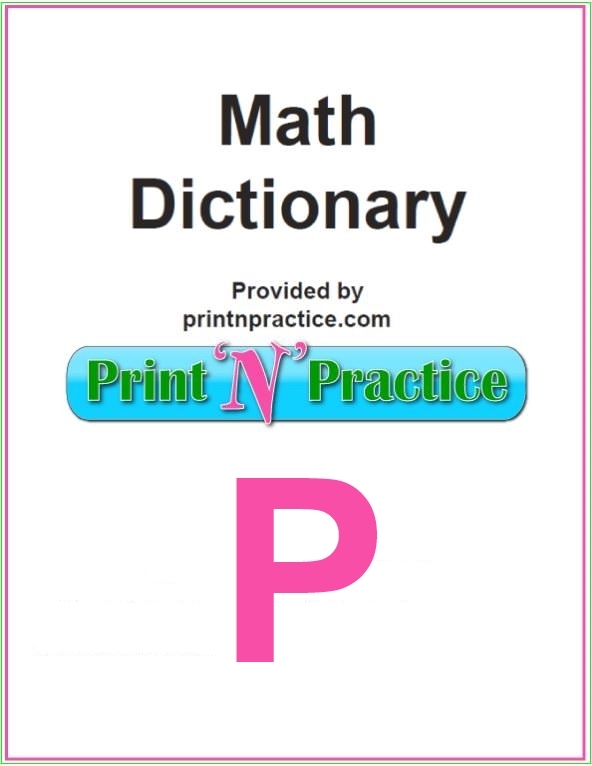 This is the Math Dictionary words that start with P for words like: parallel, perpendicular, and perimeter. Parallel is easier for kids to remember once you make the association that the double l toward the middle is a set of parallel lines. 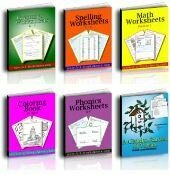 Math Words That Start With P: Fill in where your math glossary leaves off. P.M. - the period of time between noon to just before midnight. Palindromic - a positive integer is said to be palindromic with respect to a base b if its representation in base b reads the same from left to right as from right to left. 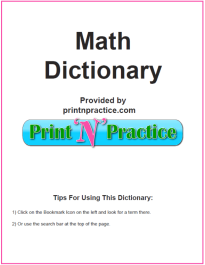 Pandigital - a decimal integer is called pandigital if it contains each of the digits from 0 to 9. Paraboloid - a paraboloid of revolution is a surface of revolution produced by rotating a parabola about its axis. Paradox - a statement that appears to contradict itself. Parallel - lines that are in the same plane that do not intersect. Parallel Straight Lines - those which have the same direction. Parallelepiped - a prism whose bases are parallelograms. Parallelogram - a quadrilateral that contains two pairs of parallel sides. Parallelopipedon - a prism having parallelograms for its bases. Parentheses - the symbols ( and ) used for grouping expressions. Partnership - the association of two or more persons in business, who unite their capital and services, and share the gains or losses according to a stipulated agreement. Pascal’s Triangle - a triangular array of binomial coefficients. Pattern - characteristic(s) observed in one item that may be repeated in similar or identical manners in other items. Pedal Triangle - the pedal triangle of a point P with respect to a triangle ABC is the triangle whose vertices are the feet of the perpendiculars dropped from P to the sides of triangle ABC. Pentagon - a five sided polygon. Pentagonal Number - a number of the form n(3n-1)/2. Pentomino - a five-square polyomino. Percent - hundredths, a ratio that compares a number to one hundred. The symbol for percent is %, (cent = 1/100). Perfect Cube - an integer is a perfect cube if it is of the form m3 where m is the integer, (m x m x m), (m)(m)(m). Perfect Number - a positive integer that is equal to the sum of its proper divisors. For example, 28 is perfect because 28=1+2+4+7+14. Perfect Power - a number which is the product of equal factors. Perfect Square - an integer of the form m2 where m is an integer, (m x m), (m)(m). Perimeter - the sum of the lengths of all the sides of a polygon, quadrangle s+s+s+s=p. Permutation - a particular ordering of a set of objects, an arrangement of objects. Perpendicular - two straight lines are said to be perpendicular if they meet at right angles. Personal View - an approach taken by mathematicians and philosophers to calculate probability. Pictograph - a graph that uses symbols to represent data. Pie Chart - a type of chart in which a circle is divided up into portions in which the area of each portion represents the size of the data. Pie Graph - a diagram showing a system of connections or interrelations between two or more things by using a circle divided into segments that look like triangular pieces of a round pie. Place Value - within a number, each digit is given a place value depending on it’s location within the number; ones, tens, hundreds, thousands. Plane - a two-dimensional area in geometry. Plane Surface - one with which a straight line joining any two of its points, will exactly coincide. Plus sign - the + sign used to indicate the addition of numbers. Point - has no dimension, it has position only. Point - in geometry, a point represents a position, but has no size. A point called a vortex. Polar Axis - a ray from the pole in a fixed direction, analogous to the x-axis in the Cartesian system. The angle between this fixed ray and a ray through the pole and the point of interest gives the value of theta in the coordinate pair (r,theta) used in the polar coordinate system. Pole - in the polar coordinate system, a fixed point, analogous to the origin in the Cartesian coordinate system. The distance from this point to a point of interest gives the value of r in the coordinate pair (r,theta) used in the polar coordinate system. Polygon - a closed plane figure formed by three or more line segments that do not cross over each other. Polyhedra - any solid figure with an outer surface composed of polygon faces. Polyhedron - a three-dimensional object whose faces are polygons. Polyomino - a planar figure consisting of congruent squares joined edge-to-edge. Positive Number - numbers that appear to the right of zero on the number line, a number having a plus sign either expressed or understood. Power - either the number itself, or the product arising from using the number a certain number of times as a factor. Practical Number - a positive integer m such that every natural number n not exceeding m is a sum of distinct divisors of m.
Prime - a number that has exactly two factors one and itself. Prime Number - a number that has exactly two factors, 1 and the number itself. Primitive Pythagorean Triangle - a right triangle whose sides are relatively prime integers. Primitive Root of Unity - the complex number z is a primitive nth root of unity if zn=1 but zk is not equal to 1 for any positive integer k less than n.
Principle - a fundamental truth from which other truths are derived. Prism - a polyhedron that is formed with two parallel polygons that are connected at the edges with rectangles. Prism - a solid whose bases are equal polygons, and whose sides are parallelograms. Prisoners - values for c in the Julia Set or Mandelbrot set where at each iteration the resulting value becomes smaller and smaller, approaching zero. Probability - the measure of how likely it is for an event to occur. Problem - a question to be solved. Product - the answer when you multiply two (or more) numbers. Factor x Factor = Product. Pronic Number - a number of the form n(n+1). Proof - an argument that shows something (like a theorem) is true beyond any doubt. Proper Fraction - a simple fraction whose value is less than one, the numerator is smaller than the denominator. Property of Zero for Multiplication - zero times any number is zero. Proportion - two ratios that are equivalent to each other, two equal ratios conected by an equal sign. Protractor - an instrument used to measure and draw angles on a flat surface. Pyramid - a three-dimensional solid whose base is a polygon and whose sides are triangles that come to a point at the top. Pythagorean Theorem - the sum of the squares of the lengths of the legs of a right triangle is equal to the square of the length of the hypotenuse. Pythagorean Triangle - a right triangle whose sides are integers. Pythagorean Triple - an ordered set of three positive integers (a,b,c) such that a2+b2=c2. Pythagorean Triples - whole numbers that work together in the Pythagorean theorem. How to keep these definitions straight? Make associations with related words. Draw or trace the image if possible. 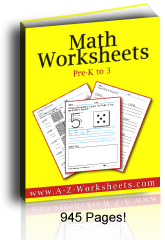 Once children have a good definition explained to them and they then use the word in a sentence or Math word problem, they're much more likely to understand and remember the definitions. I myself did not have an easy time remembering which was parallel and which was perpendicular until I began teaching Math. I remember them now because I've taught them and had to make the demonstrations, but also because the word parallel has the double L clue - those letters themselves are parallel. It's also a good way to remember that the spelling has the L twice. Thank you for visiting our Math words that start with P.